We are in the midst of another snowy day in the midwest. The darling Dr. took an overnight bag to the hospital today, here’s hoping he has a quiet call night gets lots of sleep! Here are a few things I have enjoyed reading recently. Thought I would pass them along! One day I will shoot with a Nikon D90. In the meantime, enjoy fuzziness! Back to our regularly scheduled programing. Is that a gross question? I was skeptical at first, but it’s delicious. 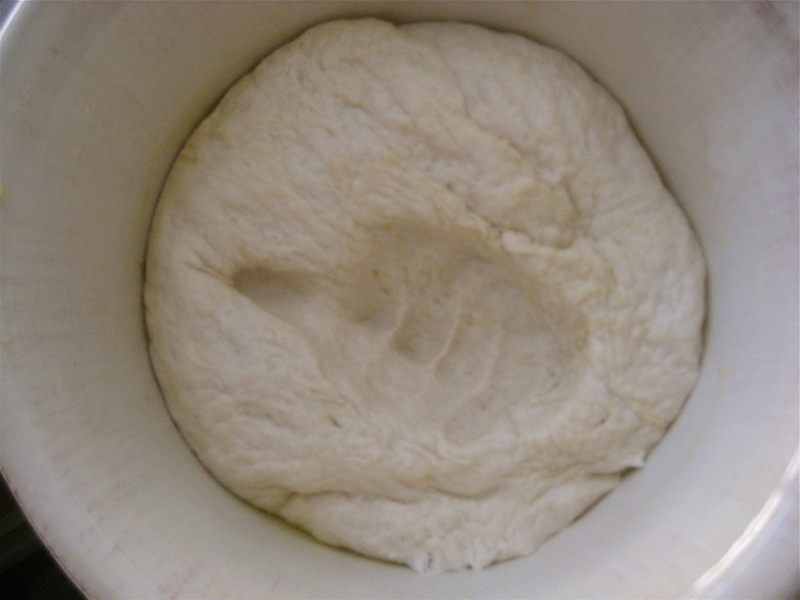 First, start off the dough by letting sugar, water and yeast sit together for 5 minutes until it gets foamy. That doesn’t look like dough, but it will. Whisk in oil and salt. 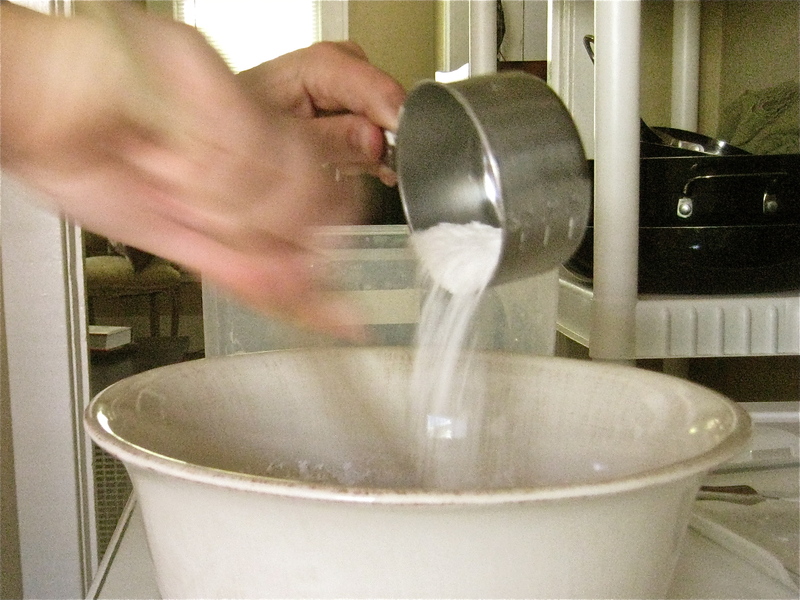 Stir in flour with a spoon. 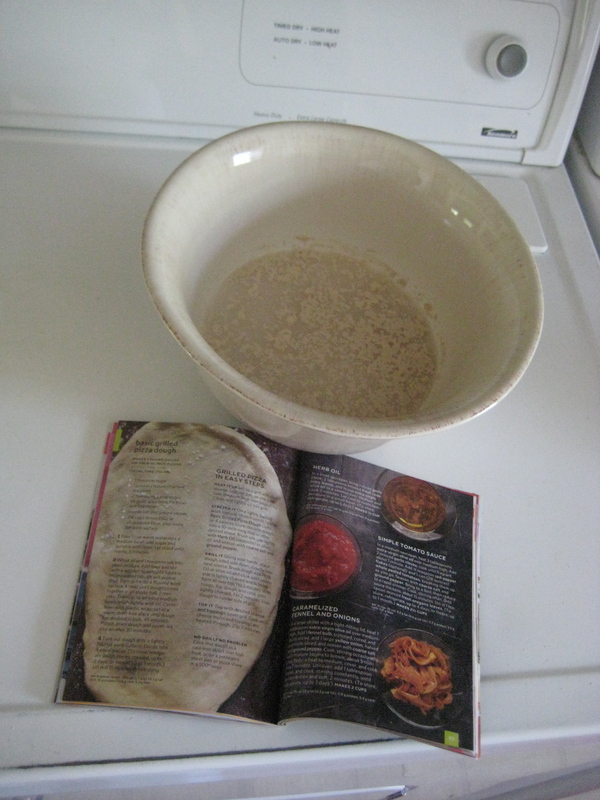 Place the dough in a well-oiled bowl and then let it sit for 45 minutes until it gets all big. Then, you get to punch it down – woot! That’s my favorite part. Let it rise another 30, then take it out and split into 4 even(ish) balls of dough. They should sit for 15 minutes, and then you can roll them out to oval pizza shapes. While the dough is rising, you can assemble the pizza sauce, which is a-mazing. Please ignore the fact that I didn’t mince my own garlic or grow my own oregano. Take some olive oil in a pan, and gently saute the garlic for a minute or two. Add red pepper flakes. 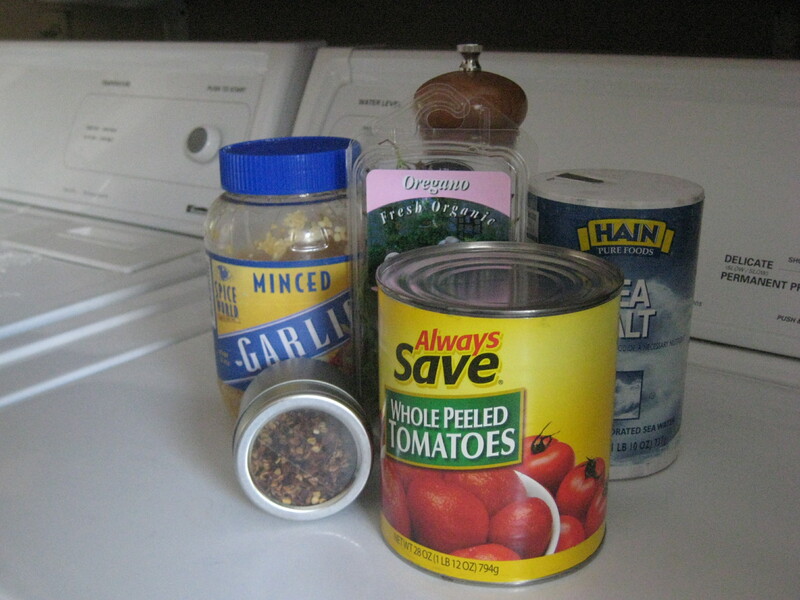 Add canned whole tomatoes. Add salt and pepper, and let it simmer a while. 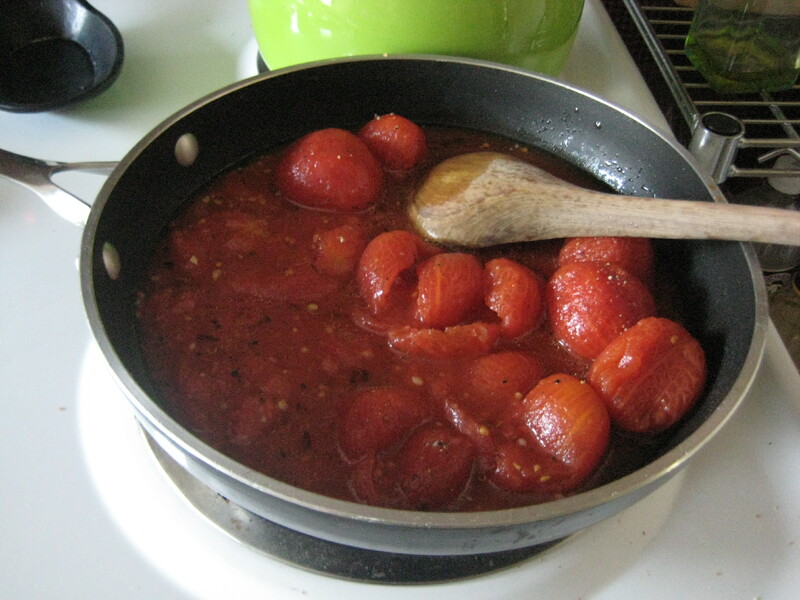 While you are stirring, continue to smash the whole tomatoes until they turn into a nice mush. Wearing an apron to avoid flying tomato insides is advisable. When it’s nice and thick, it’s done. Pizza sauce, feta, onions, various colored peppers, mozzarella, tomatoes, ham, corn, pineapple, basil, oregano, and pepper. 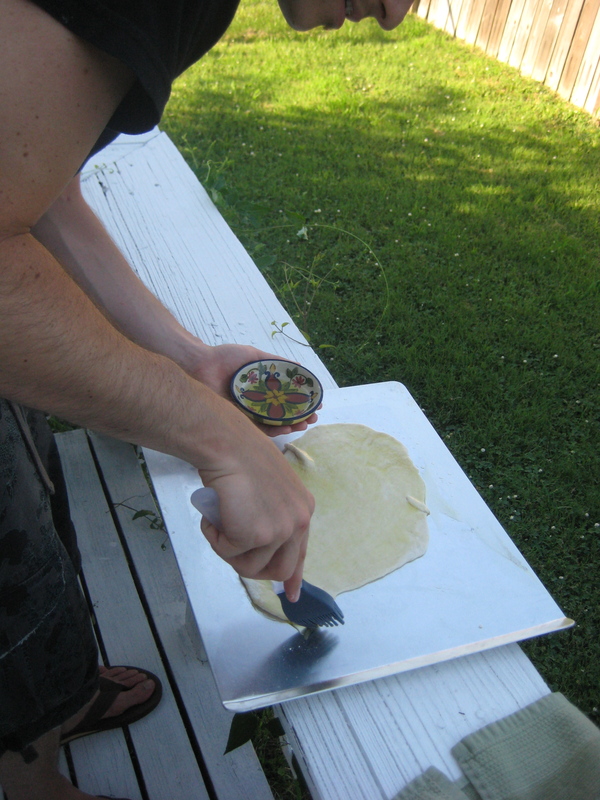 Once all of this is done & assembled, take the pizza dough you have rolled out to the grill. This is the point where I thought it might get sketchy. Dough on a grill?? Make sure you oil up both the grill and the pizza dough well. Then put the oiled side of the dough onto the oiled grill. It takes about 2-3 minutes for one side to cook. Now it’s starting to look delicious! 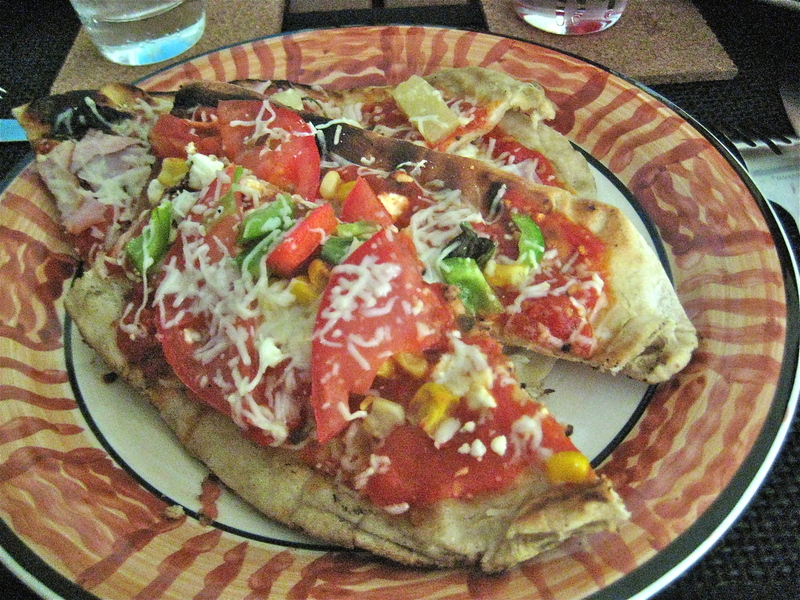 Once toppings are topped, put the pizza back on the grill, cover and let cook until the cheese is melted. You will notice that one side of the grill has the coals and the other doesn’t. The coal side is for baking, the non-coal side for warming up the toppings. 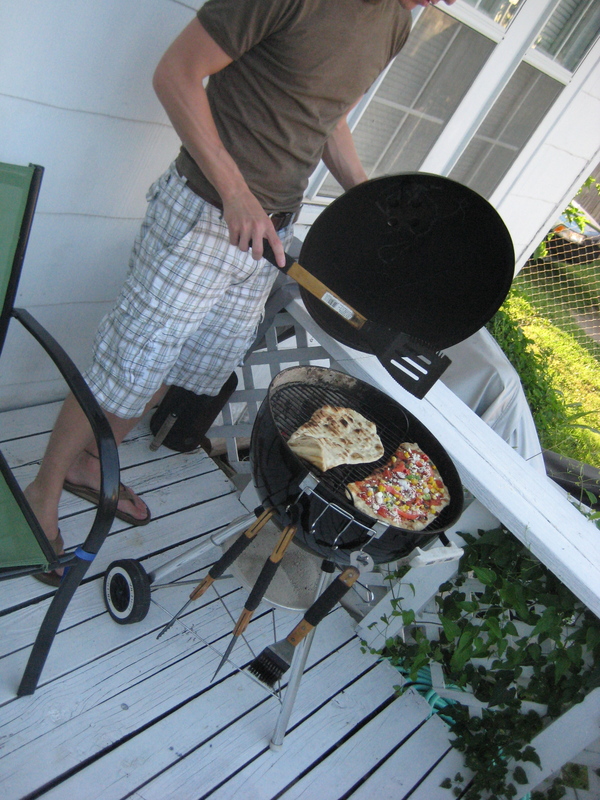 However, if you are like us and have a small grill, then it won’t be a perfect science of where the pizza’s go, or that the lid stays on the whole time after the completed pizzas are back. All the better if he’s good-looking and married to you. 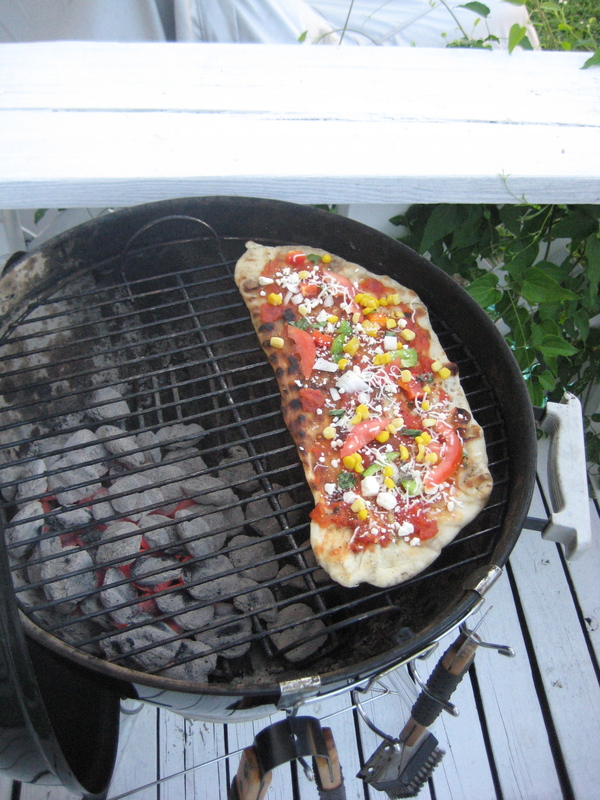 Finally, after a cruel 3 to 5 more minutes on the grill, your pizza’s are done! Take them off, cut them up and serve them with a salad or fruit or just more pizza. And, this is the MOST IMPORTANT PART…..please share it with dear friends. But don’t feed any to him, even if he wants it. What about you? 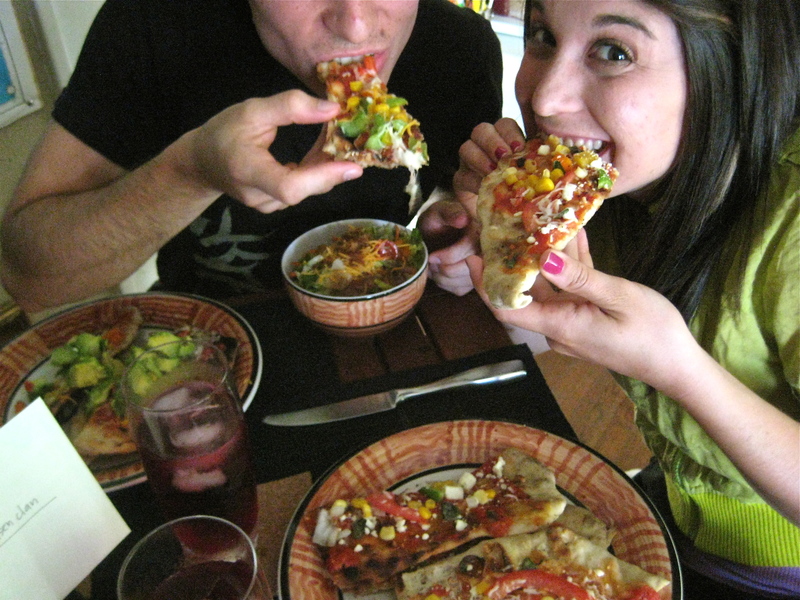 Any amazing recipes you’ve had lately? Feel free to drop me a line or post a link! Here’s the recipes for you guys. Try it out, I PROMISE you won’t regret it. 3. 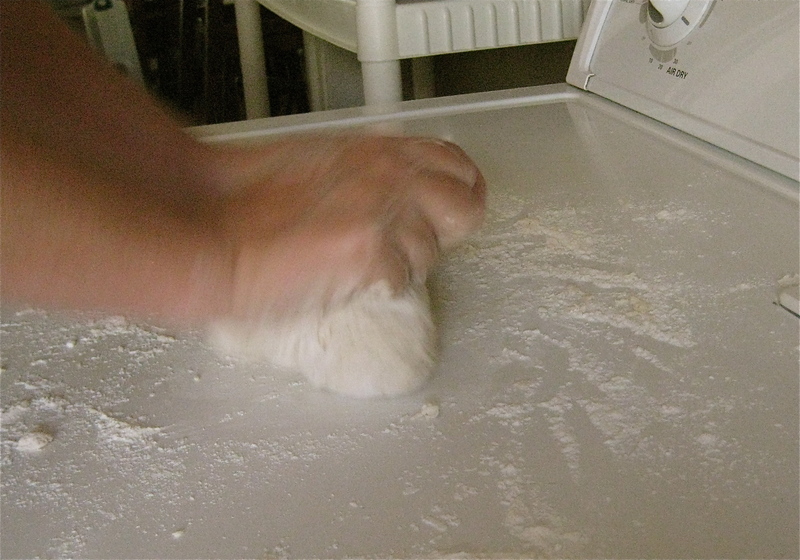 Turn dough onto a lightly floured work surface. 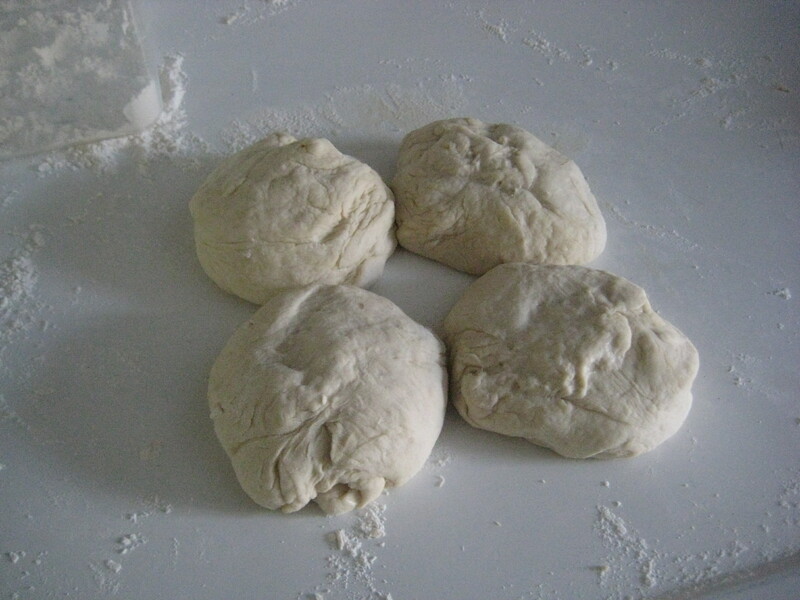 Divide into 4 equal pieces (To store, refrigerate dough pieces, cover, up to 2 days or freeze up to 1 month). Let rest 15 minutes before using. 4. 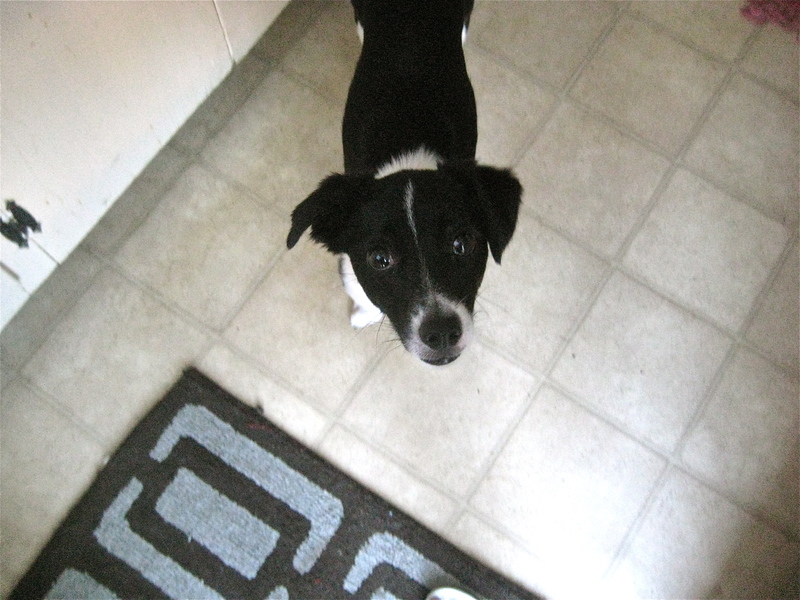 On a lightly floured work surface, stretch or roll out into a 10-in long oval or other desired shape. Brush one side with oil (can add salt & pepper). 5. Using your hands, place dough, oiled side down, onto the grill directly over heat source (be sure to oil the grill as well!). Brush dough with oil and cook until under-side is lightly charred and bubbles form all over the top, 1 to 2 minutes. 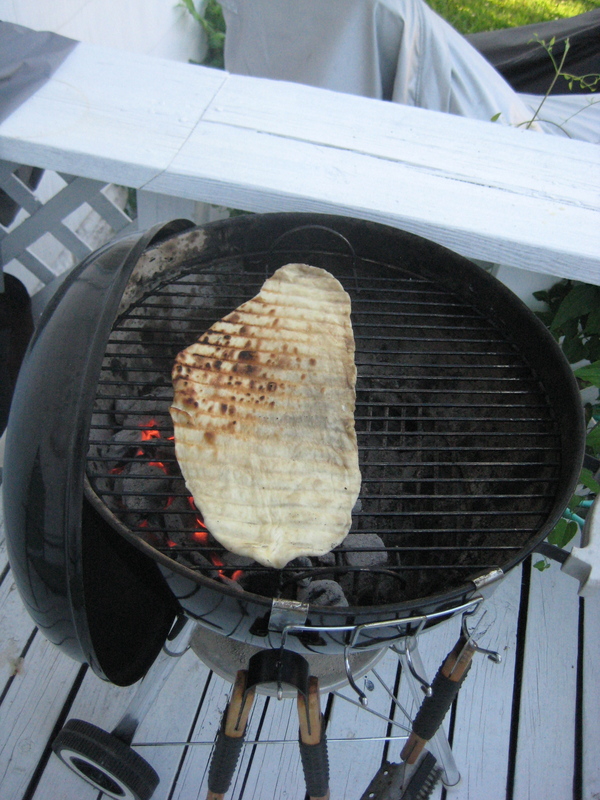 With tongs, flip dough and cook until lightly charred, 1 to 2 minutes. 6. Top with desired toppings, place on cooler side of grill. Cover grill. 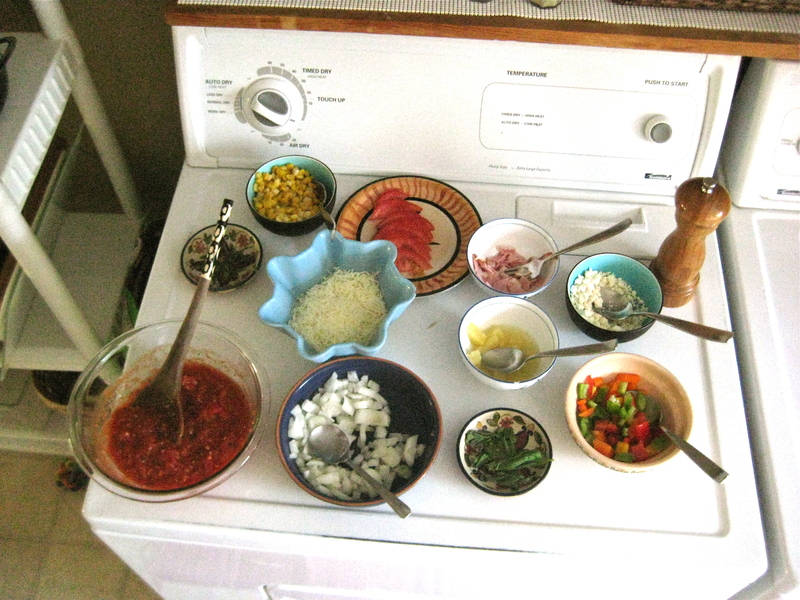 Cook until cheese melts and toppings are heated through, 2 to 5 minutes. In a medium saucepan, heat olive oil and add garlic. Cook until fragrant. Add pepper lakes and tomatoes, breaking them up as you go. Season with salt and pepper. Bring to a boil, then reduce to a rapid simmer. Cook, stirring often, until sauce thickens, about 15 minutes. Stir in oregano leaves. To store, refrigerate up to 4 days or freeze up to 1 month.